Regular book price $19.95. 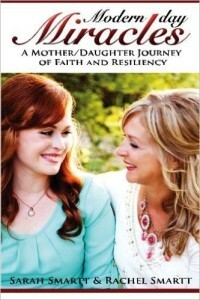 Modern Day Miracles portrays a remarkable mother and daughter journey of faith and resiliency. In this insightful and inspirational book, Rachel and Sarah Smartt share how they faced critical and life-threatening challenges, found answers, replaced doubt with certitude and feelings of abandonment with heavenly joy. Their story will renew and deepen your relationship with the One, who loves you most and will increase your trust, reliance, and confidence in God. The Smartt women guide us along with their life path and demonstrate how to handle difficulties with faith and how believing in miracles is essential to receive them.